Set up a Yoximo (mobile) or Yomani (non-mobile) payment terminal via (W)LAN for use with Worldline payment processing in Lightspeed Retail. If you purchased your Yomani/Yoximo payment terminal from a different supplier (other than Wordline), please check with Worldline if the terminal can be assigned to Lightspeed Retail POS; some suppliers block their terminals from being connected to another POS system. The Yomani/Yoximo payment terminals are currently only supported on the iPad with the Lightspeed Retail POS app. The payment terminal must be running software version 14.06.00 or later. For all issues related to the payment terminal itself, contact Worldline Support directly. 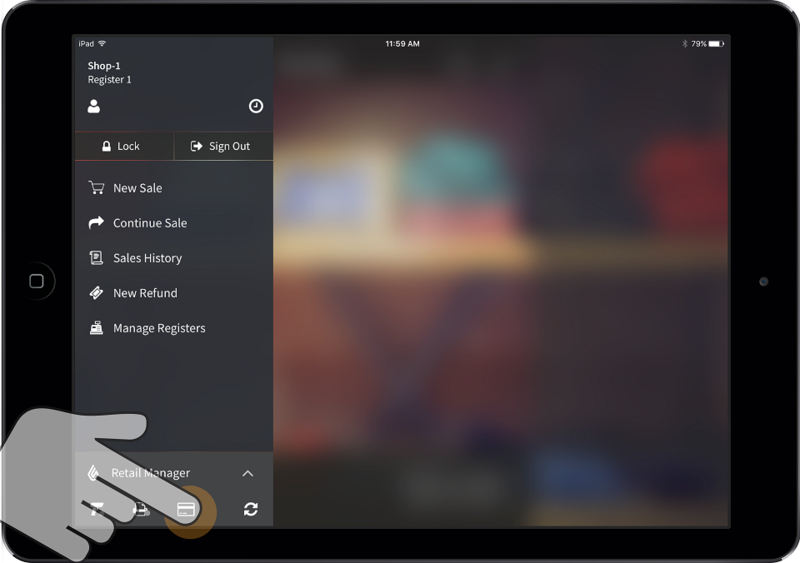 Log on to the Retail POS app in Retail Manager mode. Open the Main Menu and tap Retail Manager. Tap Settings > Payment Processing. Tap + Add a Payment Gateway. From the Select Gateway drop-down, select Worldline. Assign a Name: Enter a unique gateway configuration name that is more intuitive to you (we recommend to create a separate gateway for every shop location). Select Shops: Select the shop(s) that will be using this gateway to process payments. Credit Card Payment Mapping: Map all card brands to their corresponding payment types to configure how they will appear in your reporting. Tap the blue Save button. For you changes to take effect, sign out of the Retail POS app and sign back in. Connect the Yomani-terminal to your LAN (Recommended). Connect the Yomani-terminal with a LAN-cable to your router. Power on the Yomani terminal by connecting the power supply. Connect the Yoximo or Yomani-terminal to your WLAN. Power on the Yoximo terminal by pressing the yellow Corr/ON button. To access the terminal menu, press Menu. Power on the Yomani terminal by connecting the power supply. To access the terminal menu, press Stop > OK > Menu. From the terminal menu, press 3. Terminal Setup > 5. Wireless Settings. Enter the merchant password. The merchant password is typically the last four digits of the terminal ID. Press OK.
Press 1. WLAN Settings > 2. Add WLAN > 2. Scan. A list of available wireless networks is shown. Select your WLAN. Enter a priority for the network. The terminal will select the network with the highest priority (0) at start up. Press OK. The terminal displays a confirmation that the WLAN has been added. First, we ensure that the ECR Protocol is set to CTEP. Press Stop > OK > Menu to access the terminal menu. Press 3. Terminal Setup > 10. Next (0 on keypad). The Technician only password is 1235789, then press OK. Check the ECR Protocol. When this is not set as CTEP, choose Change in the right top corner. Press 9. CTEP. You return to the menu that starts with Communications. From this menu, press 9. ECR Physical Conf. . Check the ECR Physical Configuration. When this is not set as TCP/IP, choose Change in the right top corner. Press 2. TCP/IP. Press OK for TCP Configuration Client. Enter the Hostname (IP address) of your iPad. To access your IP address on the iPad, tap Settings > Wi-Fi, then select the blue "i" button to display the network information. A "part" of the IP-address is entered. Between each separate number of the IP address, in stead of entering a dot, press OK.
For example: 192 > OK > 168 > OK > 0 > OK > 123 > OK. There's a final empty screen named Hostname, press OK. Enter the port number (9000). Press OK.
You will return to the menu. Press Stop multiple times in order for the terminal to reboot. Tap the Card Reader icon from the Main Menu. The app Device Settings opens. Tap Payment Terminal. 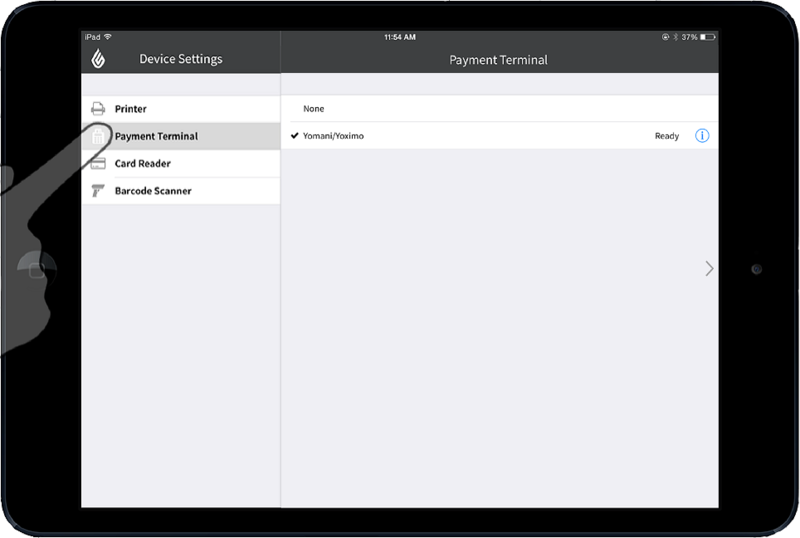 Select Yomani/Yoximo to connect your iPad to the payment terminal. The terminal will then show as “Ready”. You are now ready to process payments through Worldline. To learn how to process refunds and exchanges on your iPad, click here.